Knives of Alaska Cutlery Company was founded in the year 1993. They are popular for their hunting gear and knives. In today’s article we will try to choose the best Knives of Alaska knife suitable for hunting and skinning. 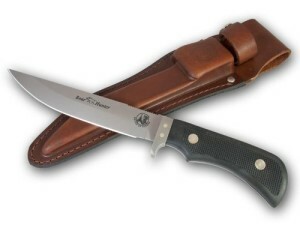 Knives of Alaska are well known for making best and affordable knives of top quality. Their knives are made from the best metals and leathers. Their products are specially designed for hunting, fishing, mountain climbing and such outdoor activities. 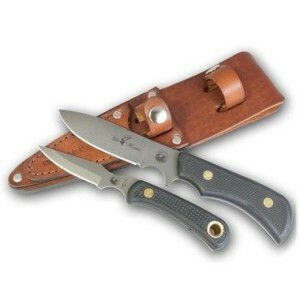 These knives are the best companions for those hunters who are self-contained and demanding about the very best gears. The knives are considered as the personal objects of pride and a precision tool that needs to perform its task efficiently, safely, and reliably each time. The Knives made by the company have led climbers, hunters and fishermen into the Alaskan bush for many years. The company promises their clients that the knives manufactured by them are of excellent quality standards that will ensure user satisfaction and pride of possession. The warranty does not cover the damage caused as a result of tool abuse. The leather sheath also does not come under the warranty policy. For returning the knives or for sending them back for repair, the client has to fill up the customer return form on the ‘return’ page of the company website and follow the further instructions there. This 10 inch long knife has a 5.5 inch long blade made from D2 tool steel blade. The blade features hunters’ non-glare matte finish. These knives ensure deep penetration. Click here to buy the Xtreme Boar Hunter Suregrip on Amazon! This gut hook knife is perfect for skinning and field dressing. It is of ceramic peened hunters Non-glare finish. The knife is 7.5 inches long and the D2 stainless steel blade occupies 4.5 inches. The knife weighs 6.2 ounce. Click here to get the Magnum Alaskan Guthook Knife on Amazon! These knives are perfect for the big game hunters who opt for a hunting knife with a large skinning radius. 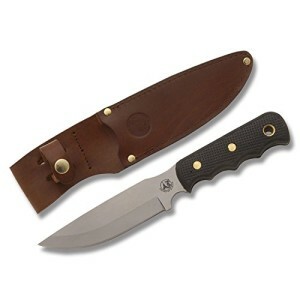 The 6-inch blade is made of drop point style and the finish is ceramic peened hunters Non-glare finish. The blade is manufactured from full tang D2 tool steel. Click here to buy the Suregrip Bush Camp Knife on Amazon! This knife series are named after Jaeger, a bird that looks like hawk. This is one of the smooth and glossiest of the knives made by the company. These are specially designed for caping and boning. The knife is 8 ¼ inches long in which the D2 stainless steel blade covers a length of 3 ½ inches. There are nonslip ridges on the back of the knife blade. The finger grooves and the deep front choil ensure a strong grip. Click here to buy the Suregrip Jaeger Boning Knife on Amazon! The combo includes an elk hunter knife and a cub bear caping knife. These knives are offered for those hunters who opt for a more complete but weightless skinning set. The elk hunter knife is 21.3cm long with a blade length of 8.3cm. These knives can withstand the roughest abuse and extensive skinning. The cub bear knife is perfect for caping and skinning purposes. The 7 cm blade is fixed to a black rubberized sure grip handle. 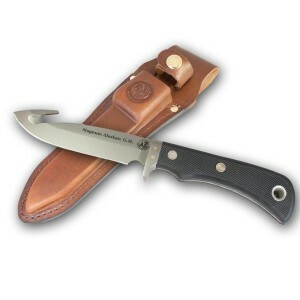 Click here to buy the Elk Hunter / Cub Bear Knife Combo on Amazon!